The Coast Guard said it doesn't believe anyone is on the surface of the water and the search would end at sundown. Still missing in rough, cold water were Oakland Raiders linebacker Marquis Cooper, free-agent defensive lineman Corey Smith and former South Florida player William Bleakley. "We're extremely confident that if there are any survivors on the surface of the water that we would have found them," Coast Guard Capt. Timothy Close said. Hopes were raised Monday when rescue crews found a fourth man who was aboard, 24-year-old former South Florida player Nick Schuyler, who managed to stay with the boat for more than 36 hours after it overturned Saturday evening. Prospects for survival were beginning to look more grim throughout the day, with the father of one of the men saying the Coast Guard told him privately that officials were losing hope because of the time that has passed and the possibility the men would be suffering from hypothermia. Coast Guard officials said publicly that they were still hopeful. 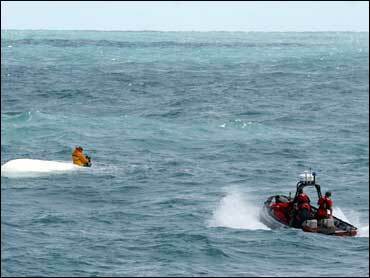 Close said searchers found a cooler and a life jacket 16 miles southeast of the boat. Schuyler told the Coast Guard that the boat was anchored when it capsized in high seas. He said the four friends were able to put on life vests and huddle together, but the others eventually became separated. Schuyler was dehydrated and showing symptoms of hypothermia, but his condition was upgraded to fair on Tuesday. Cooper, a 26-year-old who owns the boat, was selected in the third round of the 2004 draft by the Tampa Bay Buccaneers out of Washington. He played 26 games for the Bucs in his first two pro seasons, then led a nomadic NFL existence. Jack Scharf, Cooper's agent, said he had no comment on the Coast Guard's announcement. A man who answered the phone at the home of Smith's father, sounding upset, said no one there could comment. Cooper and Smith, 29, became friends when they were teammates at Tampa Bay. Smith signed with the Bucs as an undrafted free agent in 2002, and spent last season with Detroit before becoming a free agent. The former North Carolina State standout recorded 42 tackles (28 solo), three sacks and 10 special teams tackles in 2008, his best NFL season. Bleakley, a 25-year-old former tight end from Crystal River, Fla., was on the USF football team in 2004 and 2005. He had one reception for 13 yards in his career, which also included some time on special teams. Mario Bridges, the best friend of Corey Smith, told Early Show anchor Maggie Rodriguez that Smith had expressed some concern before this weekend's trip. "He actually said that he was never going to go back out there," Bridges said. "He said that Sunday when he came back, that he was never going to go because, you know, they were far out, and he felt like the boat was a little small for how far they were out. "And then Friday he called and said that he was going. And I was surprised at that. We talked about it. But he said he was going to go ahead and go this last time. And now this is where we're at."